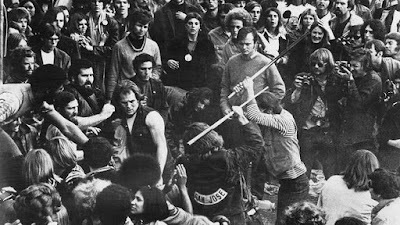 A fan is beaten by Hells Angels at the Rolling Stones' free concert at Altamont Speedway. 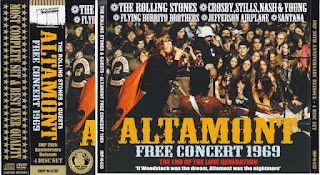 "Gimme Shelter" is a 1970 documentary film chronicling the last weeks of The Rolling Stones' 1969 US tour which culminated in the Altamont Free Concert. The rock press called it the end of innocence. 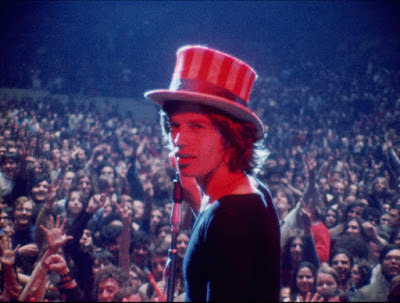 Gimme Shelter shows a clash of two worlds – the hippy culture of San Francisco and the older, nastier, darker venom of the bikie outlaws, hired with $500 worth of free beer to protect the Stones and keep the kids off the low stage. 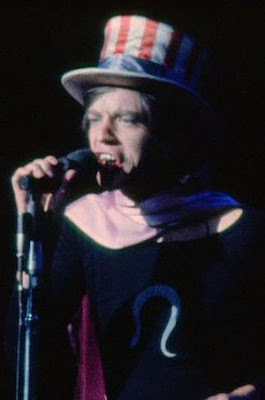 The British branch of Hells Angels had done this without trouble at the Stones' concert in Hyde Park earlier that year, but the northern Californian chapters were a different breed. Apocalypse Now is a 1979 American epic adventure war film set during the Vietnam War, produced and directed by Francis Ford Coppola, and starring Marlon Brando, Robert Duvall, and Martin Sheen. The film follows the central character, Captain Benjamin L. Willard (Sheen), on a secret mission to assassinate the renegade and presumed insane Colonel Walter E. Kurtz (Brando). Apocalypse Now was released to wide acclaim. It was honored with the Palme d'Or at Cannes, and nominated for the Academy Award for Best Picture and the Golden Globe Award for Best Motion Picture. It is considered to be one of the greatest films ever made.